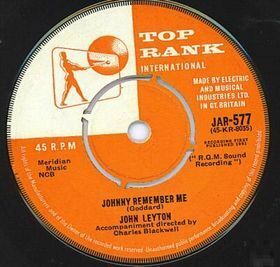 English actor John Leyton was persuaded by his manager, Robert Stigwood, to audition for Joe Meek – and successfully recorded a cover version of “Tell Laura I Love Her”. His big hit – though – “Johnny Remember Me” – nicely coincided with his appearance in television series ‘Harpers West One’ in which he played a character named ‘Johnny’. “Johnny Remember Me” (written by Geoff Goddard ) was a masterwork of Meek. With amazing production. And backing by his ‘house band’ – the Outlaws. But none of these acts had enjoyed any major chart success at that time. So it was considered expedient to choose the far more famous and reliable singer John Leyton – star of film, TV and the pop charts – to headline this crucial Croydon show. However, Leyton reported sick on the night. His appearance was cancelled. And this bit of fortune went into kick-starting their career.